Surely Dan should be President of the Watch Committee. I'm in. But only on birthdays. So, is the emperor wearing new birthday clothes ? The emperor is an insufferable narcissist, and what's worse a philosophical solipsist with delusional patterns of bipolarity. He would be a big improvement over any of the Repugnicans on the ballots. He's an OUTSTANDING music stand, however. You're right. There has never been a better music stand. Why would anyone want to be an emperor? You'd have to move to Antarctica and spend the winter standing on an ice floe trying to keep an egg warm. You live in a buffalo dude? Is it dead? JFYI, Rap's birthday evidently is tomorrow (for the persnickety of y'all, I recognize that it is his birthday *anniversary*) so let's go easy on the aged. Humph. I just re-read this thread and it appears that it sprang into being *because* you know that it's Rap's birthday. Sometimes I am dim. Verily. Why should your Emperor settle for underlings when Chongx itself is available? Your Emperor thanks you. Your Emperor herewith appoints and commissions, by revokable Imperial Writ, olddude as Enforcer and Bouncer Extraordinary w/Portfolio. Your Emperor has done stranger things than sitting on an egg until it hatches, for Your Emperor is a retired librarian and dealt for many, many years with the unwashed patrons. I sat on gum once, does that count. 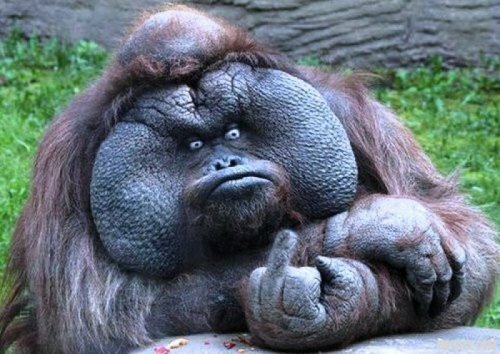 My God...that is the UGLIEST ape I have ever seen! You know, Chongo usually doesn't much like Orangutans. I hereby do appoint Catspaw49, known colloquially as Spaw, the Patron Saint and Spiritual Leader of This, Our Empire. Let it be done as I say! Good move. I miss Spaw. what happened to the possum? Subject: RE: BS: Cleigh O'Possum: I'M LEAVING! It's news to me Sins! As a matter of fact he's been real happy lately and "Artie" has been a lot of company to him. Artie seems to be a real hoot to Cleigh and I just went in and looked and Artie is swingin' and Cleigh is grinning like always.........said they were both pretty happy! I think we have an impostor here trying to stir up trouble. Cleigh has been really happy to since Cletus went cross-eyed staring at Artie's head bouncing and tail swinging. THAT really endeared him to Cleigh so I don't think that was for real at all!!!! "An emperor needs only his imagination." All vice is licensed by the Emperor. So is all non-vice. What is not mandatory is forbidden, except that the forbidden can become mandatory. And Mrs Rap for Empress? Should she need some regalia, I have a gen-u-ine 1960s rhinestone tiara (a very pretty sparkly little trinket it is too) which I will hire out for quite a reasonable fee. She still have her opera-length kid gloves (no, I'm not kidding -- she grew up in DC). Besides, a tiara would go to her head. Lots of things will fall through the cracks of article 22 of forbidden mandatoriousness. That's when the wisdom of an emperor will shine or display the truth of a squatting monkey. Rap you know the book never published is in the anals / annals of the posts that Spaw posted under three different names. I would begin with the Eureka post of waking up with profound inspiration. Some come in sequence and a number f brain droppings would fill it out to the end. $ goes to widow and son. Now why didn't the rest of us think of "awesome"? Of course it rhymes.